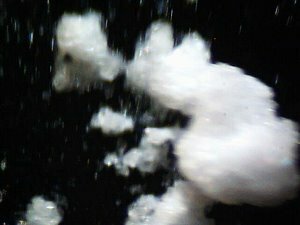 A method of extracting DNA samples from living forms has been established. The protocol being followed is that from the Genetic Services Learning Center at the University of Utah1. The methods have been applied successfully to human and fruit samples. Equipment to examine the internal structure of the DNA samples is not available at this time; visual microscopy techniques at relatively high magnification (~10,000x) are available. 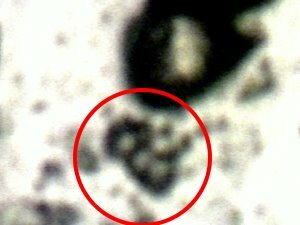 The initial finding is that the Chlamydia-like organism under extensive study with respect to the so-called “Morgellons” condition occurs in relatively large numbers within the human DNA samples that have been studied and that it can be readily identified with sufficient magnification. 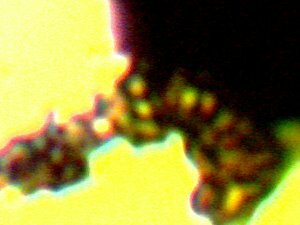 This further confirms the supposition that this particular organism appears to broadly distributed within human physiology, and that its existence should not be restricted to blood sample examination. Thus far, this particular organism has been found within dental samples, saliva samples, urinary samples, red blood cells (erythrocytes) and anomalous skin filaments. The particular DNA sample examined here is developed from human saliva. Human DNA sample extracted from saliva. . The Chlamydia-like organism identified within the human DNA sample. . 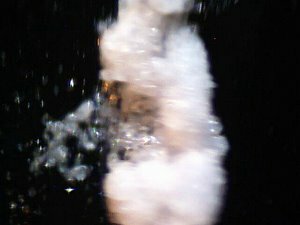 This photograph is taken from the original sample prior to any cultured result. The size of the individual organism, as reported previously, is approximately 0.5 to 0.8 microns. 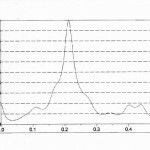 The limit of conventional light microscopy is. approximately 1000-2000x. Magnification approx.10,000x. An additional representative cluster of the Chlamydia-like organisms identified within the human DNA sample. . 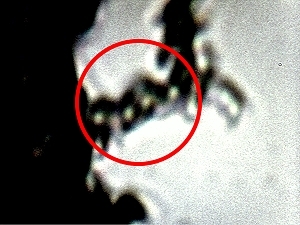 This photograph is taken from original sample prior to any cultured result. The size of the individual organism, as reported previously, is approximately 0.5 to 0.8 microns. Secondly, the Chlamydia-like organism has been successfully cultured from its origin in the human DNA sample. The culture medium is again red wine. Most biochemical reactions take place within a specific pH range, and the chemistry of wine will become increasingly important in the understanding of why this particular medium is repeatedly favorable toward a multitude of culture developments under way. The chemistry of wine is relatively complex and eventually the various components that are favorable toward growth will require isolation and identification. It is presumed that the pH of red wine (acidic) will be one important factor to be identified within this future analysis as it takes place; a first hypothesis may be that this pathogenic form favors an acidic environment within the body. 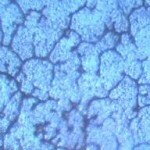 It is also reasonable to suggest the hypothesis that a shift toward increased alkalinity within the growth medium may eventually serve as an inhibiting growth factor. The current culture under analysis is approximately 7-8 weeks of age. A culture of the DNA sample in a red wine medium. . The earlier stages of the identified pathogenic cycle are contained within this level of growth. This includes extensive development of the Chlamydia-like organism, the pleomorphic structures (tentative candidate is Mycoplasma-like) and the eventual encasing filament structure (red arrows). The erythrocytic form is not identified within this culture. Age of culture is approximately 7 to 8 weeks. An additional view of the culture of the DNA sample in a red wine medium. 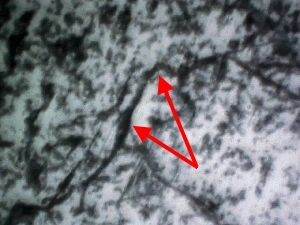 Arrows point to the early development of the filament stage of the growth cycle. The background growth is composed primarily of the Chlamydia-like organism. The age of the culture is approximately 7 to 8 weeks. A focus on the Chlamdia-like organism that has developed from the culture of the human DNA sample (red circle encloses four individual structures). Magnification level approx. 10,000x. Another. 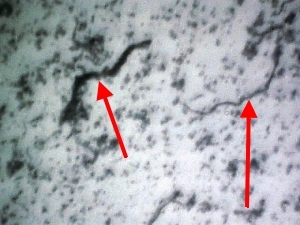 example of the Chlamdia-like organisms that have developed from the culture of the human DNA sample (red circle). 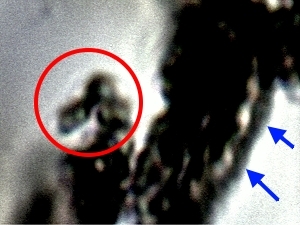 In addition, the pleomorphic and early stages of the filament form (blue arrows). are also contained within this photograph. Magnification level approx. 10,000x. Third, the DNA sourced culture that has been developed demonstrates identical growth to that which develops from the dental filament cultures. In addition, as reported earlier, an environmental source for an identical growth cycle has been established; this is the unusual airborne filament sample that has been extensively reported on over the years. The identification of the nature of this filament sample has been refused by the U.S. Environmental Protection Agency (EPA). Please refer to the paper entitled “Morgellons : An Environmental Source” for additional documentation on this recent development. Lastly, It is now to be reported that the growth from the DNA culture as shown in this report is identical (to the magnification level that is available) to that of the airborne environmental sample culture described in the earlier report . The level of congruence between environmental sampling, biological sampling, and culture developments is sufficient to merit extensive and detailed study and discussion with respect to the Morgellons condition. Additional preliminary studies also indicate that these examinations should be extended beyond consideration of the human organism.